I’ve had a very odd weekend. First, I’ve taken a dozen or so phone calls from concerned relatives and friends over this NYTimes article. But a bigger issue is that the Internet was down in the house starting late Friday night, so I haven’t been online much. On Saturday I called Comcast, my service provider, and a recorded system said it would be back up in 30 minutes. That never happened. So I’ve been running around to various cafes and friend’s houses to steal bandwidth and try to be online at least a little. The best connection was at Keith Teare’s house, but I had to deal with a chicken roaming around his front yard (picture) and making a lot of noise. They don’t know where the chicken came from, it just sort of moved in and won’t leave. This is Palo Alto we’re talking about. 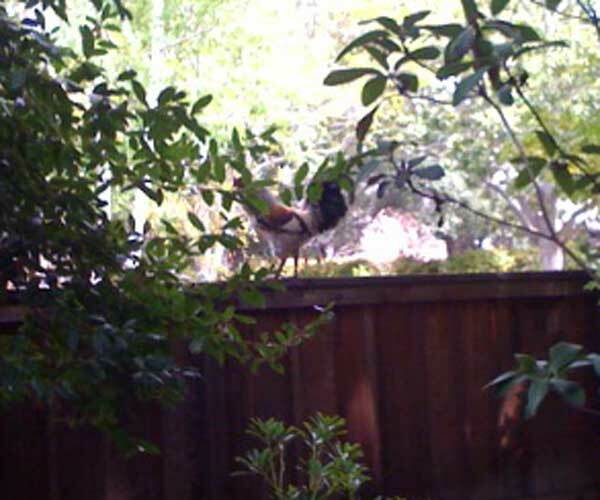 There should be no live chickens in Palo Alto. But I digress. This morning, going on 36 hours of down time, I called again, waded through the automated system and a pitch to get a new premium cable company, and spoke to a real person. She told me that Comcast was having a California-wide outage and didn’t know when it would be back up. i hung up on her mid-sentence. This California-wide outage seemed to be limited to my house – all of my friends said their Comcast connection was just fine. And then I lost my cool, tearing into Comcast on Twitter . Jeff Jarvis and others picked up the story and blogged about it. And this brings me to the point of this post. Within 20 minutes of my first Twitter message I got a call from a Comcast executive in Philadelphia who wanted to know how he could help. He said he monitors Twitter and blogs to get an understanding of what people are saying about Comcast, and so he saw the discussion break out around my messages. So Comcast sent a team out to fix my connection and apologized profusely, which is great for me but doesn’t help the other customers who don’t think to complain publicly about the company. Nor does it address the fact that Comcast and other cable providers have little incentive to invest in infrastructure or customer service since they have geographic monopolies on their service. But wow, they’re doing at least one thing right. Well before most people they have identified blogs, and particularly Twitter, as an excellent early warning system to flag possible brand implosions. This may help them avoid situations like what Dell went through with Jeff Jarvis in 2005. And a piece of advice to anyone with a Comcast service problem. Skip the hold time on their customer service line and go on the attack at Twitter instead. You may find your problem fixed in a hurry.